At the age of 15, Austrian born Bernhard Mairinger began his formal culinary training as the Commis de Cuisine at Austria Classic Hotel Aichinger, a four star Resort & Spa where he worked during his tenure at the respected culinary academy Höhere Bundeslehranstalt für Tourismus Bad Ischl. He continued to work his way up the ranks at various restaurants and resorts throughout Europe, including Hotel Alex in Zermatt Switzerland, Ashdown Park Hotel near London, and Hotel Zürserhof, one of Austria’s top ski resorts of the Arlberg. This seven year journey led to Mairinger’s entry into the Michelin star world, in his position as Chef Tournant for Da Gianni in Mannheim, Germany. 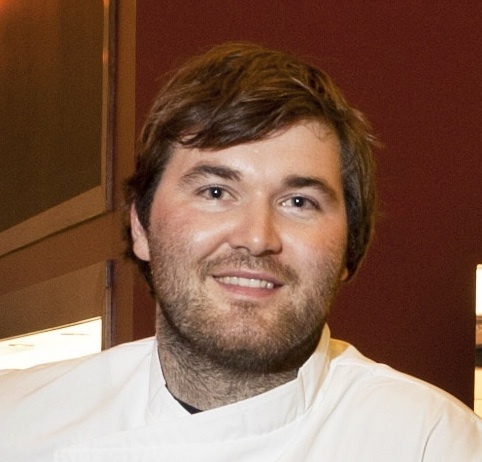 At 23, Mairinger was recruited by the Patina Restaurant Group to serve as Chef de Cuisine for Patina at the Hollywood Bowl, Nick & Stef’s Steakhouse and, most recently at Patina, the company’s Michelin star flagship restaurant, which was also rated four stars and named Best Restaurant of Los Angeles in 2010 by the Los Angeles Times. At 27, Chef Mairinger brings Los Angeles its first taste of authentic Austrian fare with the opening of his restaurant BierBeisl, his highly anticipated solo debut to LA’s dining scene. In February 2012 shortly after the restaurant opened Mairinger was named to Zagat Guides’ 30Under30 list honoring the rising stars of the Los Angeles culinary scene. After a tasting dinner of some delicious Austrian fare, I sat down with Chef Mairinger to chat about his love of traditional Austrian food, see pics at http://thedivinedish.com/?p=2855 and the opening of BierBeisl.